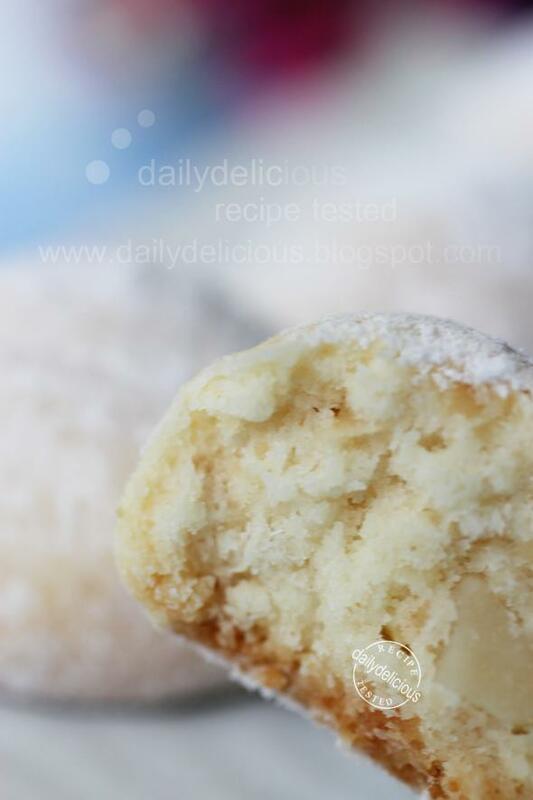 dailydelicious: Macademia Snowballs: Lovely delicious snowballs! Macademia Snowballs: Lovely delicious snowballs! 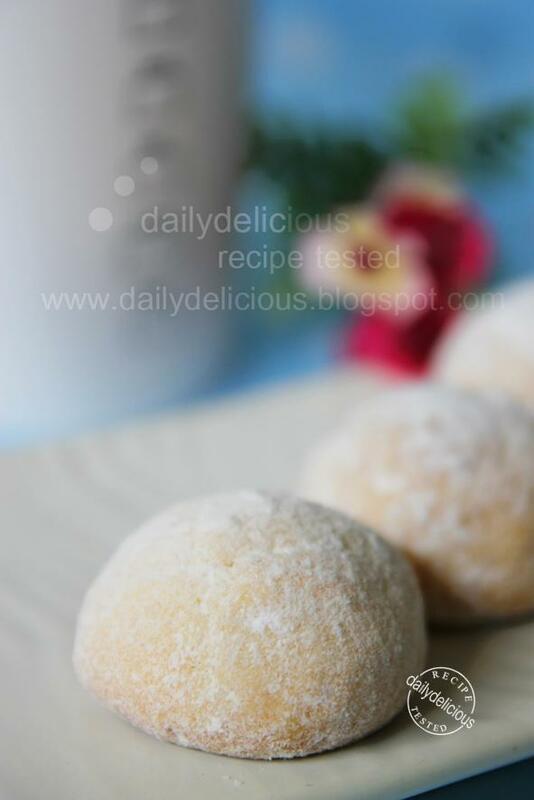 After talking about the book now it's time to try the recipe (again, ^^) and I choose the one that most of the people love, the macademia snowballs. I rarely meet anyone who hate macademia, it's one of my favorite nut. It's rich, creamy but crunchy, well it's great when adding to many kind of cakes and cookies. I think that most of you will love it too. 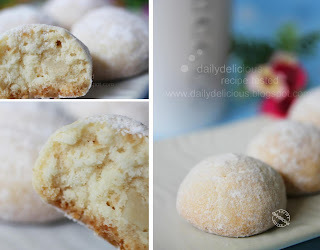 Even the cookie's name is snowball, it's your choice to use the icing sugar or not, because when I gave this cookie to my tasters (ok, my mom, my sister, and my nephew,^^), they told me how they like it and it's Three different answers, haha. My mom prefer not to use the icing sugar at all, when my nephew love it lightly dusted, and my sister think heavily coated is delicious >*<. So, I leave the decision to you, you can coat it or not, haha, up to your taste, the cookie without the icing sugar will be rich, and with a bit of sweetness, for the one with heavily coated the taste will be sweet (actually I think this one go very well with the coffee, ^^). The original recipe makes only 13 cookies and I think it's not enough, hehe, so I double the recipe, but for anyone who think that 13 pieces will be better you can half the recipe easily. Anyway for my family, 26 pieces had already gone, haha. Line the baking sheet with baking paper. Chop the nut with the knife. Beat the butter with sugar and salt until light, add the flour and beat with low speed until combine. Mix in the nut with a spatula. 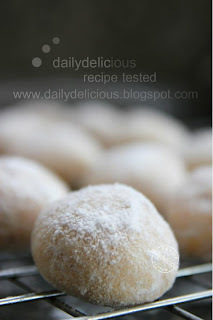 Divide the dough into pieces about 15g/piece, and roll into a ball. Then bake for 25 minutes. Let the cookies cool completely before coating it with the icing sugar. looks good that I hope I can have some now! pretty & dainty, I would love a bowl. thanks for sharing, its really yummy. but i have a problem its that, after coating with icing sugar. i find the sugar start to melt... n its sticky. do you have such problem too? For the icing sugar, if you don't want it to melt you have to use the snow powder or the icing that won't melt. Do you coat it after it's cool? Anyway,keeping the cookies in air-tight box will reduce the melting problem. 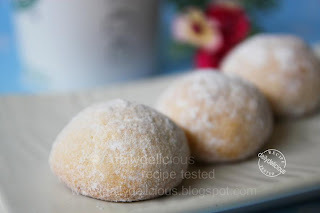 I use the simple icing sugar too ^^, after a day or two it melt a bit. I would like to ask whether i can substitute the macadamia with other nuts? if yes then what is your recommendation? 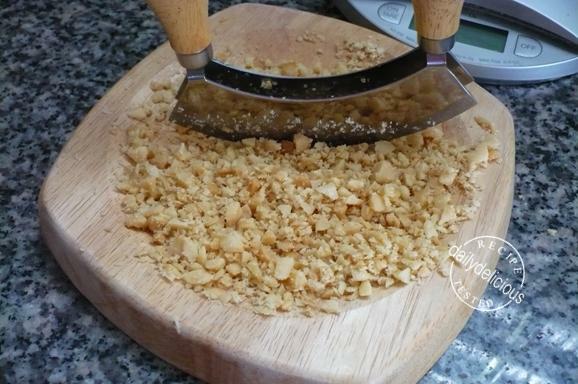 If you want to substitute other kinds of nut, you can use walnut or cashew nut, or any oily nut will do. Peanut Butter Bombs: Little cups of happiness!